This motorway is one of the busiest routes in Colombia and connects Bogota to the Pacific ports. It is planned to be renewed and widened. 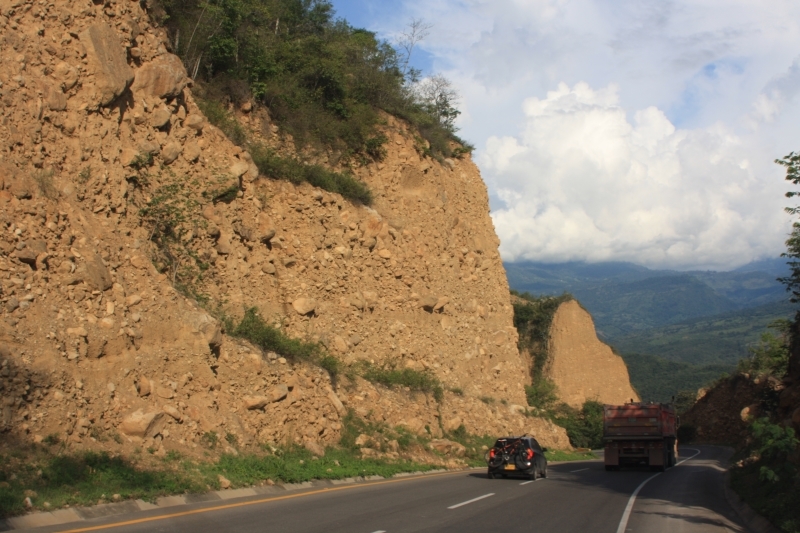 The alignment of the 147-km long motorway climbs from Girardot through the eastern Cordillera of Colombia up to the capital located at 2600 metres above sea level. It crosses mountainous terrain with active tectonics and presents many risks of slope instability, landslides and rock falls. Erosion problems influenced by the Sumapaz River along the route must also be taken into consideration. In association with the Colombian geotechnical consultancy company JEOPROBE, TERRASOL was contracted by the concession-holder VIA 40 EXPRESS (formed by VINCI and CONCONCRETO) to carry out a geotechnical assessment of the stability of the slopes along the motorway between Bogota and Girardot. TERRASOL made a one-week field visit in March 2017, followed by a risk analysis assignment on various sites along the motorway. We are also providing support for the concession-holder in selecting reinforcement solutions: in the short term, the aim is to ensure user safety with immediate effect, whereas in the long term, we have to take into account the future widening works when identifying the relevant solutions.